Diagnosing a disease is a crucial first step in providing care. However, many regions around the world lack the centralized infrastructure and trained personnel to perform these tests. This leads to the need for low-cost test alternatives, which can be administered at the point of care. To meet this demand, easy-to-read diagnostic tests constructed from paper have been developed and implemented to combat a number of diseases across the world creating nearly a $6 billion market. These paper-based tests, commonly referred to as Lateral Flow Assays, detect the presence of specific molecules in a sample such as blood or urine by inducing a color change along a 'test line' contained on the paper strip, functioning similarly to the well-known pregnancy tests. Aydogan Ozcan, Chancellor's Professor of Electrical & Computer Engineering and the associate director of the California NanoSystems Institute at UCLA led the research in collaboration with Professor Dino Di Carlo of the UCLA Bioengineering Department, Professor Omai Garner, the associate director of UCLA Clinical Microbiology Lab, and Dr. Hyou-Arm Joung, a senior research associate at UCLA Electrical & Computer Engineering Department. This new paper-based sensor employs a specially designed 'sensing membrane' that contains dozens of individual reaction spots, each of which can detect a different disease-specific molecule. This operation is made possible by the implementation of a vertical stack of paper and wax-printed layers, carefully engineered to ensure that the patient sample, in this case processed blood, uniformly interacts with each reaction spot on the 1 cm x 1 cm paper-based sensing membrane. Therefore, this multi-detection design can perform much more complex tests needed for e.g., cancer, cardiovascular disease, or Lyme disease, among others, while still employing $0.30 worth of paper materials, along with simple operating steps which can be completed in under 20 minutes with minimal training of the user. 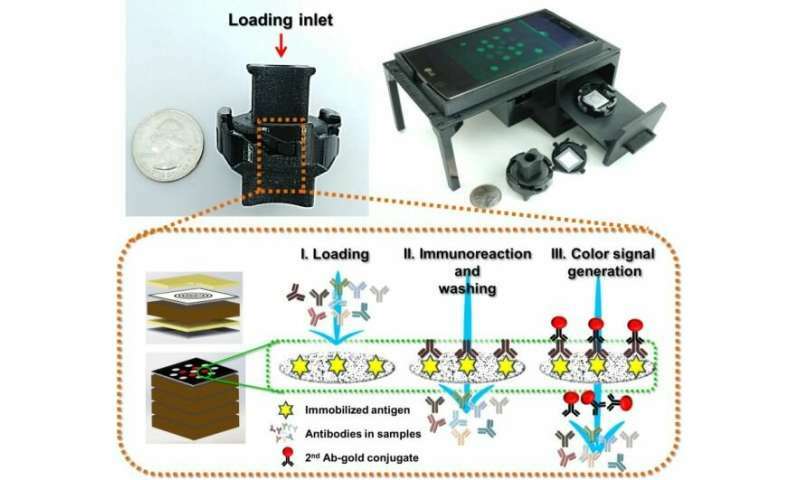 "This new multiplexed testing platform is promising to propel paper-based diagnostics into new and exciting territories as it can be adapted for a number of different diagnostic targets," said Dr. Ozcan. 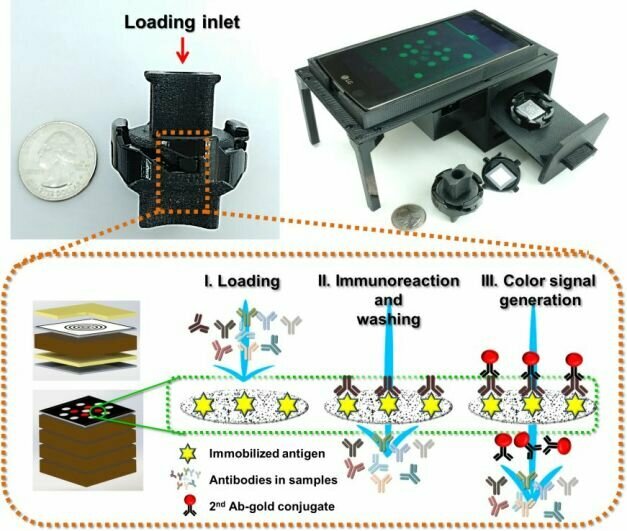 "In fact, we have already found a promising opportunity for Lyme Disease diagnosis with our multiplexed paper-based sensor."